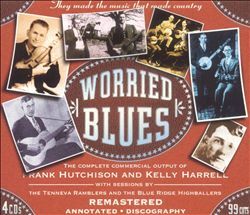 Frank Hutchison of Logan County, West Virginia recorded the slide guitar piece “Worried Blues” for Okeh first in 1926 and again in 1927. The date and place of origin of “fretting” the strings with a hand-held metal bar or glass bottle is unclear, but this was a technique widely used by African American musicians by the early 20th century. A couple of such musicians, Bill Hunt and Henry Vaughn, were important local sources for Hutchison’s music. This method of noting the strings with a steel bar, sometimes called ”slide guitar,” was also popular amongst late-19th- and 20th-century Hawaiian guitar players, who used it to make very different music that eventually spawned the many hillbilly and country music steel guitar styles still popular in the South. Hutchison’s timing is representative of many West Virginia and eastern Kentucky musicians who add or subtract phrases in very individualistic ways. Sherman Lawson, a fiddler who recorded with Hutchison in the late 1920s, remarked to me that Hutchison didn’t keep time very well. Lawson and Hutchison both had their own concept of time and phrasing, not necessarily the same. In photographs Hutchison played what looks like a small Martin guitar on his lap. He used a thumb pick and probably one or two finger picks and most likely used a small extension nut device over the regular nut in order to raise the strings up high enough off the fingerboard to play with a metal slide. The ballad, or narrative folksong, usually titled “The State of Arkansaw” has been a principal exhibit in Arkansas’s recurrent laments about its disreputable image. It is a clear example of the expressive culture of the late nineteenth century that depicted Arkansas pejoratively. The story, which the ballad relates in first person, has its protagonist—known by several names, including “Sanford Barnes” and “John Johanna”—leave his home, most frequently “Buffalo town” or “Nobleville town,” to seek employment. He hears of job opportunities in Arkansas, sets out by railway, and arrives in an Arkansas community, variously identified as Fort Smith (Sebastian County), Van Buren (Crawford County), Little Rock (Pulaski County), or Hot Springs (Garland County). There he meets a “walking skeleton” who conducts the narrator to the state’s finest hotel. One night in these accommodations convinces him to leave Arkansas immediately. His host, though, persuades him to take a job draining some land. Several weeks of hard labor in an ague-producing climate subsisting on the poorest rations (“corndodgers” and “sassafras tea”) have the narrator claiming, “I never knew what misery was till I came to Arkansas,” a refrain for several of the ballad’s stanzas. In some versions, he prefers marriage to a “squaw” in Indian Territory to life in Arkansas. The earliest printed text of this song may be that which E. C. Perrow published in Journal of American Folklore in 1913. The earliest sound recording is probably the one by Kelly Harrell and the Virginia String Band, done in a studio in Camden, New Jersey, in 1927. 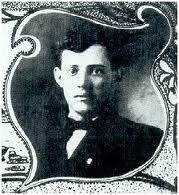 One of Vance Randolph’s Ozark consultants, however, suggested that he knew the song from the 1890s. Writing in Arkansas Historical Quarterly, Robert Morris proposed an earlier origin date, in the 1870s. Several commentators, including Library of Congress folksong researcher Alan Lomax, hypothesized that the song was of Irish-American origin. It does bear some resemblance to “The Spalpeen’s Complaint to the Cranbally Farmer,” which Patrick Weston Joyce published in 1909. Ballad scholar D. K. Wilgus reported a text of the song from Ireland and proposed that it had originated there and was imported to the United States in the late nineteenth century. When G. Malcolm Laws created his catalogue of what he called “native American ballads,” he included “The State of Arkansaw” as the first entry in his chapter “Ballads on Various Topics.” He also contributed to some confusion about the song by titling it “The Arkansas Traveler.” Though it has been reported under that name—along with “The Arkansas Navvy,” “A Hobo in Arkansas,” and “The Arkansas Emigrant,” among others—“The State of Arkansaw” has no connection with the skit and fiddle tune to which Laws’s title usually refers. It more likely derives from the tradition of complaint songs popular in the nineteenth century, which responded to the failure of westward migration to meet media-generated expectations. “The State of Arkansaw” joins “Michigan-I-O,” “The Dreary Black Hills,” “Nebraska Land,” and “The Lane County Bachelor” in a category of “folk dystopias,” hyperbolic descriptions of frontier disappointments. Kelly Harrell, a Virginia textile factory worker, never learned to play an instrument. But when he heard Charlie Poole’s popular stringband records of 1925, Harrell decided he could sing better than Poole. He took some musicians with him to audition for the Victor label. The resulting 43 records over the next 4 years are wildly uneven. As I hear them, two-thirds just don’t stand up over time — not well chosen, awkwardly arranged, listlessly sung. But sometimes … sometimes something magical happens in the recording room. Everything comes together, and those recordings are some of the best ever recorded. It is a mysterious and wonderous thing. On August 12, 1927, Harrell recorded “Row Us Over The Tide” as a duet with Henry Norton, a tenor he had never met before and would never meet again. They’re accompanied by banjo, guitar, and the strange and beautiful fiddling of Lonnie Austin. The vocals are corny and maudlin, even humorous. But I also find them uncannily moving.